SOURSOP – not just a prickly face. Learn 5 surprising health benefits of our soursop fruit (a.k.a. graviola or guanabana). Originating from tropical regions of the Americas, this prickly green fruit has a light and delicate texture, but a tangy flavour similar to acidic fruits like pineapple, strawberry and citrus. Enjoying a sub-tropical frost free climate, we’re very fortunate to be able to grow it successfully here. While soursop is popular for its delicious taste, many parts of the plant are also used medicinally. Research points to a variety of health benefits of the fresh fruit, as well as its leaves and stems. Boosts immunity Despite its sweet flavour, a serving of fresh soursop fruit is quite low in sugar, while being high in fibre, and rich in Vitamin C. In fact, just 100 grams of the fresh fruit delivers more than a third of or recommended daily dose of Vitamin C. Plant compounds which act as antioxidants can be found in the fruit too, including luteolin and quercetin. These vitamins, flavonoids and antioxidants can stimulate the production of white blood cells, reduce allergic responses, and help to neutralise free radicals and prevent chronic disease. Improves gut health An effective diuretic, consuming soursop juice can help to cleanse the gastrointestinal tract, removing toxins and excess salts from the body. The fruit also contains alkaloids that can reduce irritation in the stomach and colon. The brewing of a tea from soursop leaves is also a well-used remedy for intestinal parasites. Anti-inflammatory assets Fruits from the Annona family (which includes soursop as well as custard apple / cherimoya) contain a combination of alkaloids, phenols, and acetogenins. Research indicates that these compounds give soursop impressive anti-inflammatory properties which may reduce irritation, soothe pain and improve flexibility. Cancer treatment research Some laboratory sample tests and animal studies indicate that soursop extracts may have potential for applications in the treatment of cancer. Test tube studies resulted in soursop extract reducing the proliferation of breast cancer cells, and similar results have been replicated with other tumour cells such as pancreatic cancer. Treats insomnia Soursop tea has been used for many centuries to induce relaxation and encourage sleep. An infusion of soursop leaves has soothing and anti-inflammatory properties which are beneficial for relieving stress and anxiety. Consumed in moderation, soursop tea can assist in regulating sleep cycles and enhances wellbeing. HOW TO EAT: Fresh is best, and the fruit is available at our farm in late Summer/early Autumn. Enjoy it’s natural sweetness in smoothies and crushes, or make a delicious healthy dessert when chilled (be sure to remove seeds). Soursop leaf has a much longer shelf life and is more accessible, but has limited stock following harvesting and drying. Check our Plantation Collection website for availability and to view our current offer. Avocado's may still be our hero product, but our new Plantation Café winter menu features some more exotic fruit favourites, too. Jakfruit may be sweet, but it’s taste and texture makes it a great (vege-based) substitute for pulled pork. 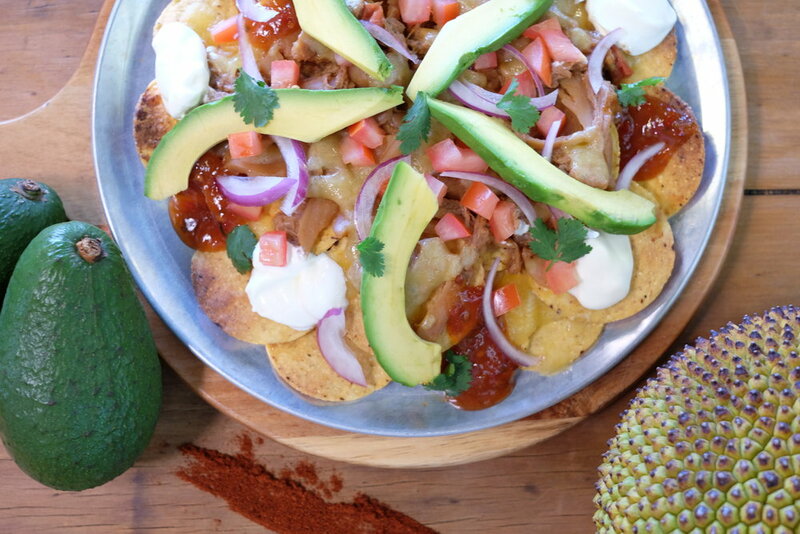 You’ll find it in our new Jakfruit Nachos. This dish celebrates jackfruit, avocado, and our own Spicy Tamarillo Sauce in a serving that’s generous enough to share. (Our innovative use of jakfruit will feature on ABC’s Landline program this winter). Other seasonal specials include Green Papaya Salad and Barramundi Lemon Myrtle Pie. Keeping it local – we’ve also introduced local brewer Stone & Wood, and granite belt winery Witches Falls to the menu.